Sometimes less is more. It certainly helps when you are in a beautiful location like Castlewood State Park, Missouri. However, it still takes a keen eye to get all the details just right like this gorgeous engagement session from Zoe Life Photography. 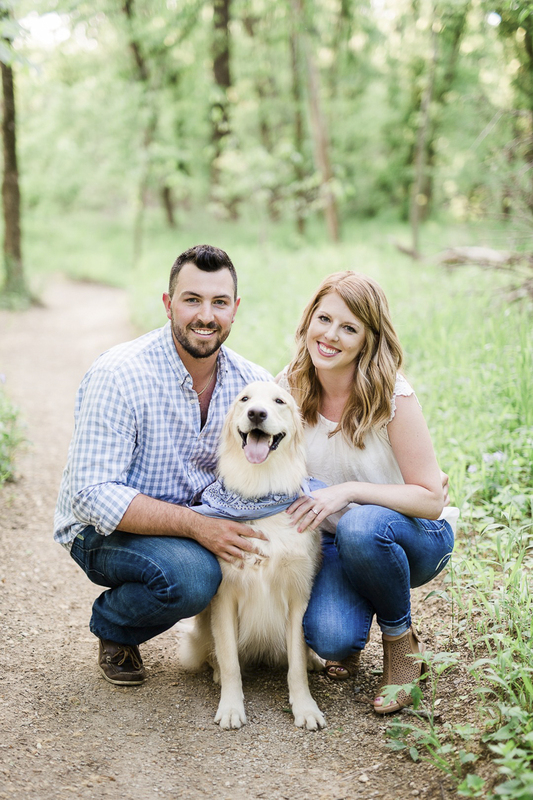 Izzy the Golden Retriever probably had as much fun as her favorite humans, Lindsey and Brady. From Zoe: “Lindsey and Brady live in St. Louis, Missouri, but they’re getting married back home in Maine next summer. So it made perfect sense to have engagement photos where they live. 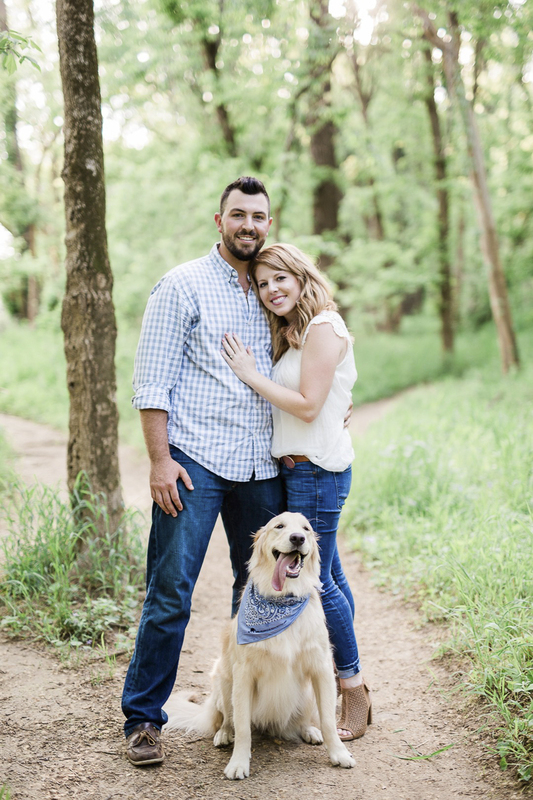 They chose Castlewood State Park, which is near their home, and it’s a park where they often walk with their adorable dog, Izzy. Izzy is the cutest golden retriever and is very well behaved. However, once she saw the water, it was all over! She swam right in and had a blast! From Lindsey: “Our Izzy girl is a 2-year-old ball of love. A little over two years ago I made the move to St Louis to be with my now fiance Brady. We got our first apartment together and were enjoying the new chapter in our lives, but figured it was a good time to add a dog to the mix. We found a newspaper ad for Golden Retriever puppies and went to take a look. And we just knew that the 8-week old fluff ball was going to change our lives forever. In true golden fashion, Izzy is just drawn to people. We can’t go anywhere without her having to make several pit stops to make sure her presence is known. Personal space is not in Izzy’s vocabulary, on any given day you can find her nestled up in your arms or laying on your legs. There’s nothing quite like being woken up by a 75-pound lap dog laying on your chest dishing out her fair share of kisses. Follow Zoe Life Photography on Instagram. 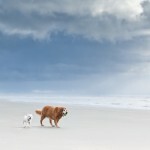 About Zoe Life Photography: Based in Nashville, Tennessee, Zoe specializes in wedding photography. She is available for worldwide destination weddings. Golden Retrievers are so beautiful! I love his little bandana too, these are great pictures. 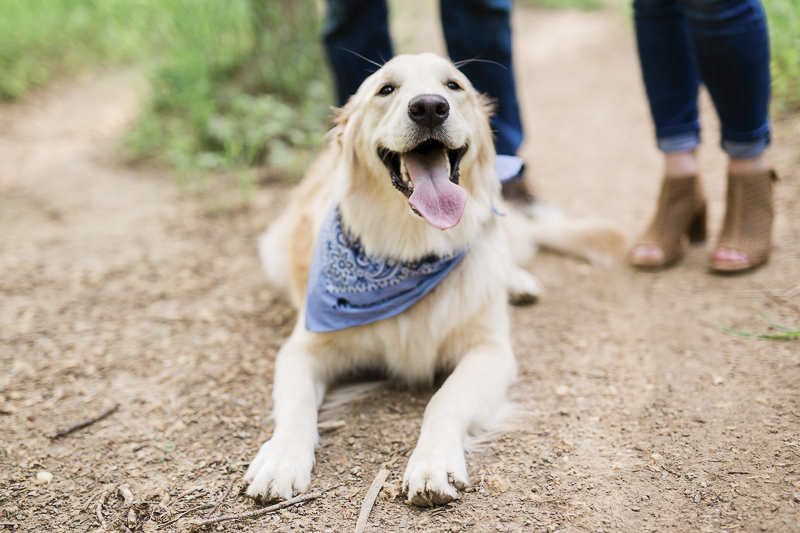 Izzy is a beautiful Golden Retriever (a dog breed I love!). I really love her smiley expression. 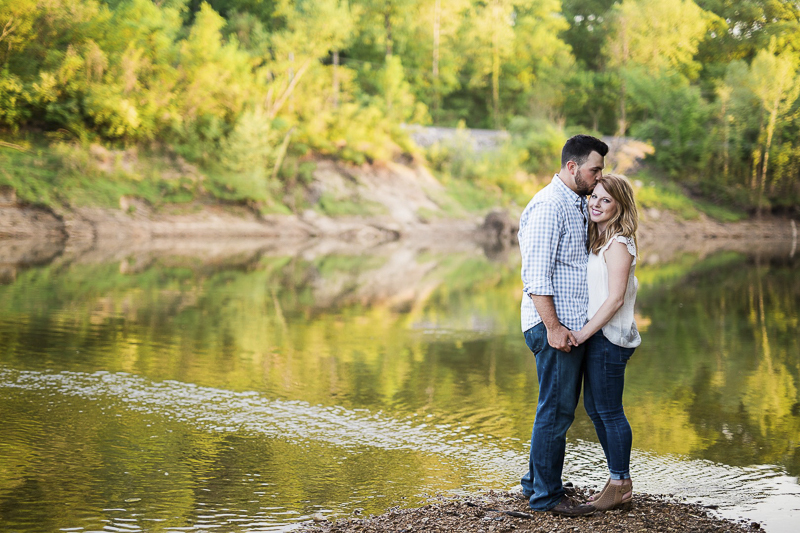 These are beautiful engagement photos! 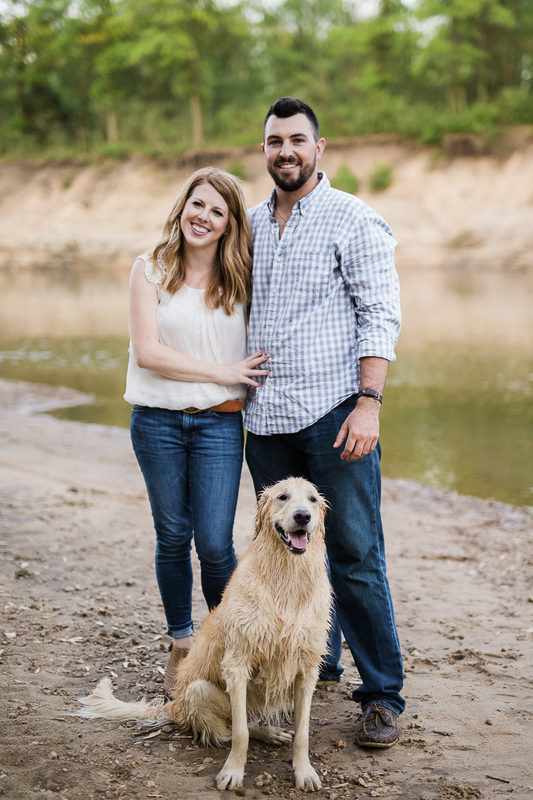 I LOVE the fact that people include their pets in their engagement photos as they are family as well! My partner and I ADORE animals, although we can’t have any where we currently live, but I know when we do, they will be a big part of everything we do. 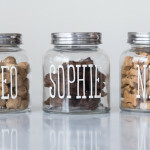 If we have one before we get married I am going to try my hardest to ensure that they are included on our special day! That’s awesome! I know you’ll have some really creative ideas for your wedding! Izzie is adorable- she looks like she’s smiling. She must be happy mom and dad are engaged. The stories here are so inspiring. The photos are so fantastic, just last week I gave the link to a client just to give her pointers on some photography ideas in order to convey a story and feeling. The photos are heart-warming! Love Izzy’s smiling face and the neckerchief. 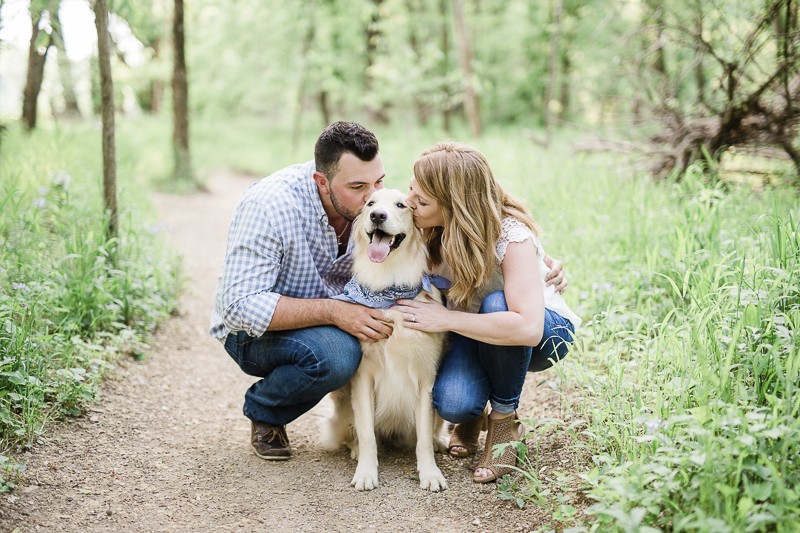 If I had a dog, I could’ve attempted to go for pre-engagement shoot with the fur-baby as well. I wish this trend catches up in my country too. The photog here is absolutely brilliant. These turned out gorgeous! So sweet to include the dog!